Giveffect is a cloud-based nonprofit management software which provides organizations with the tools for managing fundraising, donations, volunteers, members, events, websites, and more. The system is aimed at medium-sized and large registered nonprofit organizations across the US and Canada. Giveffect allows nonprofits to set up custom-branded online donation pages to process one-off and recurring donations, and track donations made both online and offline by credit card, cash, check, SMS, bitcoin, securities, in-kind items and services, and more. 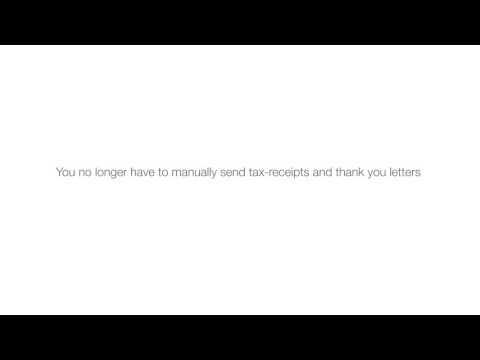 Custom thank you letters and tax receipts are automatically sent for online donations, and can be printed to send to donors through the mail. Donors can also access their information and donor profile through the donor portal. A range of other fundraising and event websites can also be created with Giveffect, for team fundraising, corporate giving, peer-to-peer fundraising, crowdfunding, auctions, and more. Giveffect’s volunteer management tools cover recruiting, scheduling, hours tracking, and reporting, with online application forms, a virtual kiosk for check-ins, automated confirmation and reminder emails, and analytics dashboards. Members can also be managed and tracked, with the ability to create an unlimited number of custom membership levels with different fees and renewal terms. Other features of Giveffect include email and direct mail marketing, wealth screening and prospect identification, relationship management, and website management. Before Giveffect, we were using BlackBaud Raiser's Edge, and no one in our office could use it well. Just to learn how to use it, our employees had to pay a large fee and go to a week long training seminar. It was not convenient, and that knowledge was lost as employees turned over. I managed to figure out how to use it myself, but wasted a lot of time. Training others on my team was next to impossible. During the initial demo, we could tell that Giveffect was leaps and bounds ahead of Raiser's Edge. With Giveffect, the software itself is very intuitive, and the provided free training video tutorials and webinars are really helpful. Even before those resources were available, it was so easy for me to just start using the system. I've since been able to set up my entire team using the system, and they've had few to no difficulties learning to use it. Our focus is now on building better relationships with our donors rather than fighting with a system to enter gift information. Giveffect has been absolutely wonderful for our team.It's so easy to use. The capacity of this software improves about every 2 weeks when they release a new update to the system. It's grown exponentially since we started using it about 2 years ago. They now provide amazing resources: training video tutorials, webinars, a Facebook group page to network with other users, etc. They just keep upgrading the system and adding new features so regularly, I truly believe Giveffect can literally do anything you need it to. "By switching to Giveffect we have eliminated having to use multiple platforms to function. Everything was separate for us before and we basically were spending a ton of time moving between software, platforms and systems that didn't communicate well together and/or did not allow us present the look and feel of our agency. With Giveffect we can easily accomplish all of our tasks from one platform AND on the front end of things it integrates seamlessly with our own website! From the get go, Giveffect's customer service has been top notch - they've had an answer for every question we've had and their team is readily available whether it is through their online "Chat with Us" feature, via phone or via email. They also do an amazing job of listening to feedback and the needs of their clients then turning around and implementing updates which allows them to offer all of us a continually evolving solution. I can't even begin to explain the amount of time we now have available each day to focus our energies on the important stuff - the kids in our program and our mission. Highly recommended! "Giveffect has consolidated our process for us and eliminated the need to use multiple platforms. The time savings for our staff has been huge! Also, the ongoing training opportunities, customer support and ever evolving aspects have been incredibly helpful and have allowed us to make our processes even more efficient. The software is also very intuitive and easy to use/understand. In addition, the team at Giveffect actually listens and evolves the software based on the growing needs of users and the clients we serve. I looked at a lot of different systems and spent a long time trying to decide and they mostly had too little functionality. Giveffect was more expensive than what we intended to spend, however we felt like we were getting more for our money to bring so many processes under one roof and I was absolutely sold how the back end of the system talks to the front end. Saves us a lot of work every day, and also provides a higher level of accountability. As far as the campaign pages and website solution, they are so attractive. We used Razoo for individual fundraisers, which would be a manual upload and a higher rate for processing fees. We used Giftworks for our CRM and donation pages, very anti-intuitive system, difficult for donors to use and we got constant complaints from the donors. So to be able to create these really attractive campaigns on top of using the website builder has been great. We are already getting a lot of positive feedback from our board, supporters, and key volunteers. The functionality is so much better, being a cloud based system, GE is much more manageable because our old system was constantly freezing or shutting down. Also, the old system had really bad customer service, we could never get any questions answered and sometimes couldn't even get a response. Giveffect gets so much credit for having people there even on Friday night to help people with their chat support questions. I really like the chat support, you just hop on the chat box, explain your problem and clearly everyone over there knows how to solve your issue pretty quickly and its been so much faster and so much more efficient for us. Highly recommend this system for any nonprofit, especially if you need a website too.Very good, friendly customer service, fast response time, forward thinking system, easy for donors to use, complete system includes CRM, campaign pages, email contact system, website and so much more. Makes my job so much easier. The ability to customize letters, communications, campaigns saves me time. Also, it makes segmenting donors incredibly easy so that communications reach the right people at the right times. It's so intuitive and easy to customize to your needs. There are no tedious forms to fill out to change or add fields, you can do most of it yourself. The campaigns are so easy to set up and easy to promote. Once your staff is familiar with the user experience troubleshooting is incredibly easy to manage. Donations come in with little to no issue. The team is so incredibly responsive and if we need something done differently it's almost always made available on the next upgrade. The tutorials are quick and painless to sit through and you can access them whenever you need to. Their webinar series is great and they do a wonderful job of keeping us up-to-date regarding changes, new functionality and upcoming tutorials and training. Donations can be processed through custom-branded online donation pages, with automatic sending of custom thank you letters and tax receipts, and the ability to track all online and offline donations. Multiple types of fundraising websites can be created to manage different types of events and campaigns, including auctions, crowdfunding, event RSVPs, corporate giving, and more. Members, fees, renewal dates, and other information can be tracked through Giveffect, with users able to create an unlimited number of custom membership levels, segment contacts, pre-authorize credit cards, run member-targeted marketing campaigns, and define membership business rules. The built-in marketing system allows users to communicate with members and contacts via email, newsletters, postcards and direct mail, with a drag-and-drop email template builder, WYSIWYG email editor, mailing list segmentation, campaign analytics, mail merge, batch printing, and more. Major gift prospects can be identified and tracked, with search tools to uncover prospects based on their nonprofit affiliations, past giving totals, and other wealth markers, and cultivation tools to move prospects through the opportunities pipeline. Below are some frequently asked questions for Giveffect. Q. What type of pricing plans does Giveffect offer? Q. Who are the typical users of Giveffect? Q. What languages does Giveffect support? Q. Does Giveffect support mobile devices? Q. Does Giveffect offer an API? No, Giveffect does not have an API available. Q. What other apps does Giveffect integrate with? Q. What level of support does Giveffect offer?